SUZUKI ensured its new SV650 drew attention at Motorcycle Live yesterday by giving it a sprinkle of magic scrambler dust. 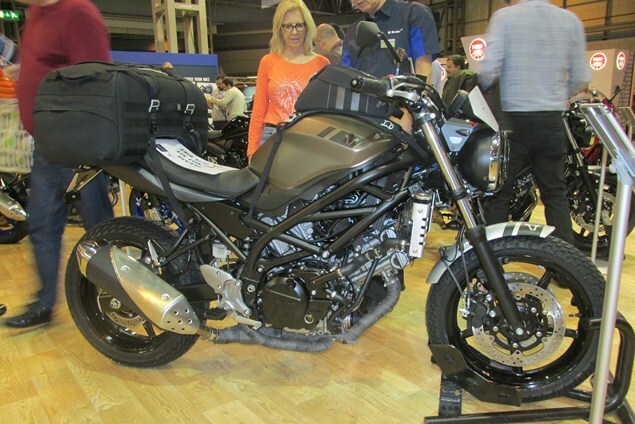 It was one of two SV650 ‘concepts’ on the stand, both essentially heavily accessorised base models. It’s got an aluminium front mudguard, fly screen, radiator guards and chain guard. The SV’s standard tyres have been swapped for deep-treaded ones and it’s gained scrambler style exhaust wrap. The headlight has grown a grill and it’s got a straight-handlebar converter kit. More tubular steel frame has been exposed, the pegs have gone scrambler-style and a tank bag and rear bag have been slung on. For all those adventures. All the accessories are from SW-Motech. The second special SV was modified with official Suzuki accessories including a numbered side-panel, a fly screen, a Yoshimura exhaust and a ribbed seat. Suzuki didn’t have prices for the treatment. The firm is also yet to confirm the price of the 2016 SV650 itself, which is actually an updated Gladius rather than a revision of the long-in-tooth aluminium-framed model it takes its name from. Suzuki GB's general manager Paul de Lusignan confirmed the SV650S, the last of those ally-framed variants, was to be discontinued, although it would ‘probably’ remain available for 2016.